REVERSE: Effigy of Czar Peter I, The Great is in dressed in armor, ready for battle.. Seated allegoric woman symbolising the Mother Russia. WATERMARK: Effigy of Czar Peter I, The Great. The 500 ruble, also known as petya, issue of 1912 is one of the most spectacular banknotes of the imperial period due to both its sharp-looking design and sheer size. This note is massive, and among the largest banknotes ever issued by any nation. It measures 275mm by 127mm, and is truly a piece of artwork. The front features the imperial coat of arms in several places, the denomination, and a watermark of Czar Peter The Great (r. 1682 - 1725) on the left-hand side. It was introduced in 1912, thus printed during the reign of Nicholas II (1896-1917) and right before, and through, World War I. 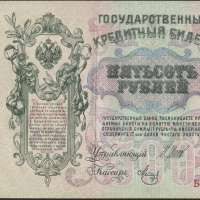 All notes bearing the signature of Shipov would have been issued between 1914 and 1917 even though the years on the notes show 1910 and 1912.